Online order forms should engage people. They should attempt to imitate an offline experience as much as possible and they are an integral part of a satisfactory customer experience. When customers browse your online store and are ready to purchase your goods or services, they should be met with hospitality and be attracted by your products/services, just as they would in a face-to-face interaction. If you’re selling more than one product or service then you need a form that can dynamically add up prices as the customer places their order. Enalyzer’s Calculator feature allows you to easily set these calculations up and merge the total score wherever you want. So, when your customer is done placing their order, you can direct them to an end page showing the total amount to be paid. Your brand should be part of your online order form. Use Enalyzer design features to add background images, change the font, and add images, videos, and even GIFs. If you’re looking for stock images, we’re glad to tell you that we’ve partnered up with Unsplash to bring over half a million high-res photos to use free of cost as your background image. With Enalyzer, you can use other question types to further engage customers and elevate their experience. For example, display your products with image choice questions. If you allow users to upload their own designs, for example, printing logos on different merchandise, you can use an image upload question that allows them to upload the design they want to be printed. Show custom messages depending on customers’ choices. Maybe an item is sold out, instead of removing it from your form, you can create a condition and show them a page informing them of when the item will be available again or ask for their email so you can inform them of its availability. Another option would be to redirect them to a page recommending other items they might be interested in based on their current basket. There are plenty of options! When a customer places an order, you need to be notified immediately. With Enalyzer, you can tag incoming responses and be notified when they come in. How? Let’s take the Business Card order form as an example, you can create a category for every package you provide and enable notifications. When someone places an order, you will be notified by email and are able to see the entire order. Just as in physical stores, when customers are ready to pay, they want to do it as fast as possible. Therefore after placing an order, they need an invoice immediately – like super fast! Don’t freak out, Enalyzer, Zapier and 1000+ apps, aka the holy trinity of productivity, has the solution. 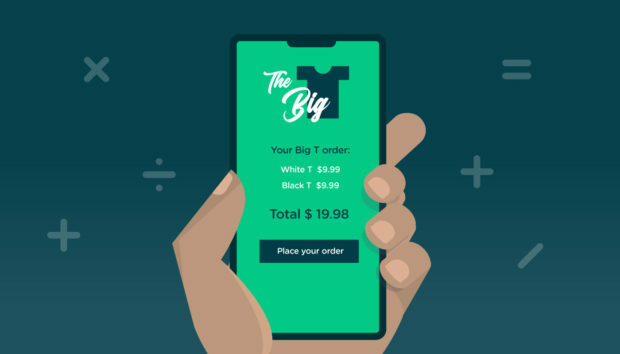 By connecting your Enalyzer account to another app via Zapier, your customers will receive an invoice instantly after clicking submit my order. How does it work? With more than 1000 apps, the possibilities are endless but we have a couple of examples. We know what you’re thinking if I have a webshop, why do I need an online order form? Plenty of reasons! For example, in case you don’t accept online payments or you need to contact your customers before the payment, a webshop checkout process might not be convenient. Instead, they can fill out your order form, you can assess their order and continue to the payment process later. With Zapier, you can connect your webshop, e.g. Shopify, to your Enalyzer account, so when customers place an order via your Enalyzer form, Zapier creates an order in Shopify. Maybe you have an independent website and use invoice platforms to manage all your invoices. No problem, we can handle that too. If you’re using an invoice app, such as Xero, Invoice Ninja or Wave you can connect them to Enalyzer and achieve the same result. 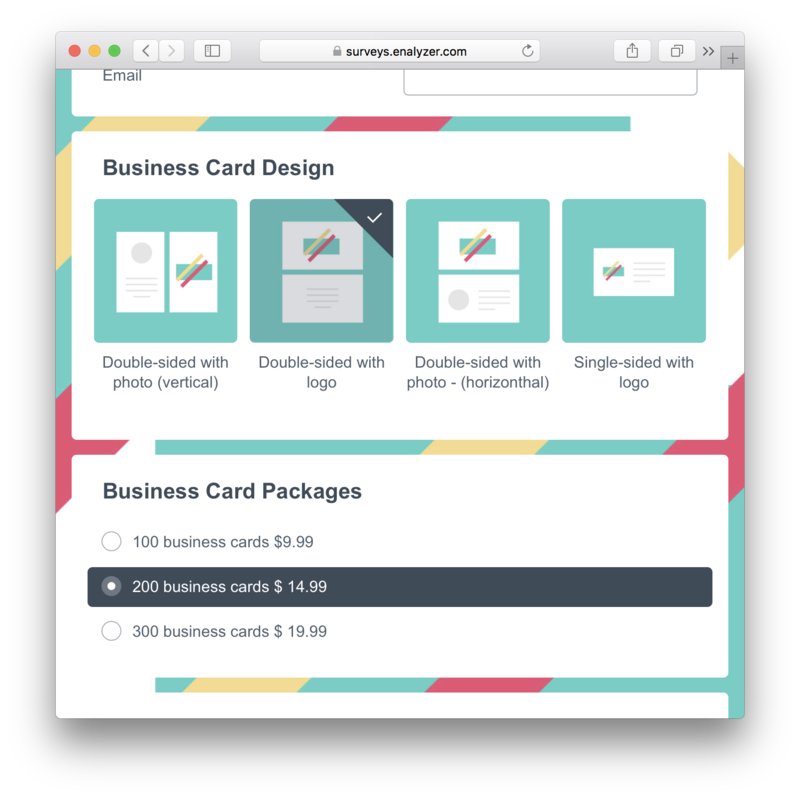 A customer places an order via your Enalyzer form, Zapier creates an invoice in your app – voila! Have you heard of Webmerge? They automatically generate PDF and Word DOCX documents merged with data from other web services. Create a simple WebMerge template, sync it up with your Enalyzer account via Zapier. And instant invoices! Online order forms are great. Having a tool that can make your online form feel like an online shop is better. To give you a sense of what you can accomplish, we recommend you have a look at Enalyzer’s order form templates. 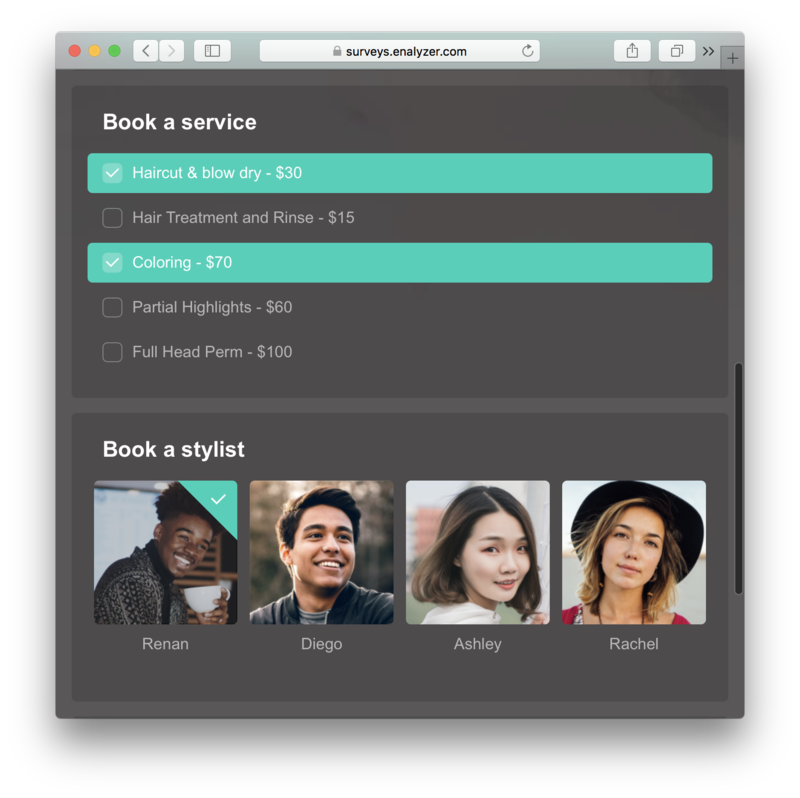 This template allows customers to make an online hair appointment. It gives customers the chance to book the time and date of the appointment, the service and the stylist. Enalyzer’s Calculator shows the price to be paid after the appointment at the end of the form. → Get template This template is a great example of a professional looking order form aiming to sell business cards packages with different designs that can be customized with a profile picture and logo. Enalyzer’s Calculator shows the final price of the purchase at the end of the form. → Learn how to use the Enalyzer Calculator!